The MSR V 006 has the smallest interrupted and jitter swiping ability in the world. Only 9mm long, shorter than a 3mm 3 Track Magnetic Head with Pin Holes connector included. 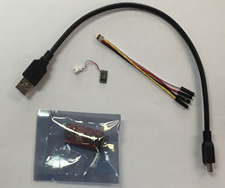 The best features of the MSR V 006 are it's tiny size - which is the smallest ever made in the world - its Pin holes USB connections which allow easy manipulation that requires less wired connections giving the possibility to transform this MSR V 006 into both a reader and a direct USB "PLUG" in. This is the only device ithat includes the possibility to manually select the swipe Direction (in or out) and get instant result. 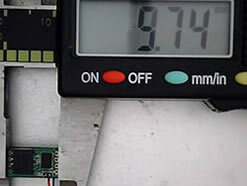 The MSR V 006 is powered by any 3V battery supply; it allows encrypting the saved data and decoding it from any computer where the encryption software is installed WITHOUT needing to connect the MSR008. 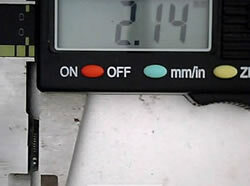 It is a 2 Magnetic Track Reader (Track 1&2 or Track 2&3, or Track 1&3). 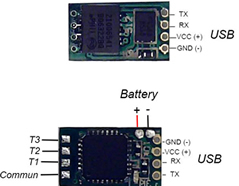 It is a stand alone device which allows collecting magnetic data without being connected to a computer. The RAM Internal memory can store up to 8000 magnetic data. Every data collected is of course timestamp in millisecond. The information (data) stored as several segments (parts) so even though the magnetic card has been read at different speeds and multiple stops the data (information) will be shown and that will allow the user to reassemble the data correctly. This technology is known today as jitter or interrupted swipes.